Road to 1st Kyu – Week 4 Day 1 – Grab My Wrist why don’t ya? Today was a rousing class. There were only three of us and our teacher Charlie this evening. This evening we worked on variations from “ushiro” attacks. Ushiro translates loosely to “from behind”. The attack happens in the following manner: Uke (the attacker) starts to walk around nage (the person being attacked) and first grabs nage’s right wrist with his right hand. The intention is that as he walks around, he will attempt to grab the left wrist as he is behind you, and then do something nasty like throw you out of the bar you are in before last call. There are a host of techniques that nage can apply to defend against an attack like this. On the first kyu test I will be expected to do 5 variations both from standing and kneeling positions. At this point I don’t think I’ve talked too much about “why the wrist grab?” And further, there are people who say that there is no practical application to learning techniques from a wrist grab. Aikido and many other related arts like ju jitsu practice techniques from a wrist grab to understand the bio mechanics of how the body moves. From the wrist grab, we can do techniques and get a better understanding of our bodies and how we can move our bodies, connect and blend with our partners and get a feel for how we can move our partners bodies through the act of connecting with them. This is a fundamental building block of Aikido and an important one. If you are wondering where this originated from, keep in mind that Aikido is a synthesis of some older arts (daito ryu ju jitsu). The wrist grab in fact was a practical defense on the battle field. If someone found themselves unarmed against an opponent that still had their sword in their scabbard, they will attempt to grab the wrist to attempt a joint lock. Their opponent would have techniques that they could draw upon to escape the joint lock, draw their sword and dispense the enemy. We also practice techniques on our knees. This had practical application back when the Samurai would be sitting in their house and all of a sudden the marauding hordes would storm the house. The Samurai would have to defend before he was able to stand so there was practicality in training on one’s knees. These days, we practice kneeling techniques as a training device. Any technique that we have trouble with from a standing position will be amplified greatly when you are on your knees. If you can work techniques on your knees and get the kinks out, then it makes the standing techniques that much easier. Why do I write this? Hell, I don’t know. I love Aikido. Maybe the two or three of you reading this already know this stuff. Maybe you don’t. I love to share information, and by expressing this, it helps me gain a better insight and knowledge into my own path. So, thank you for allowing me this indulgence! 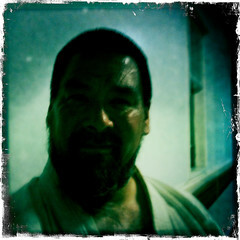 This entry was posted in Uncategorized and tagged Aikido, First Kyu, Grab My Wrist, Katate, Process, Testing by markdeso. Bookmark the permalink.